While coffee is great, there comes a time every semester where it just doesn’t cut it and I find myself reaching for the hard stuff… you know… Sugar Free Red Bull. 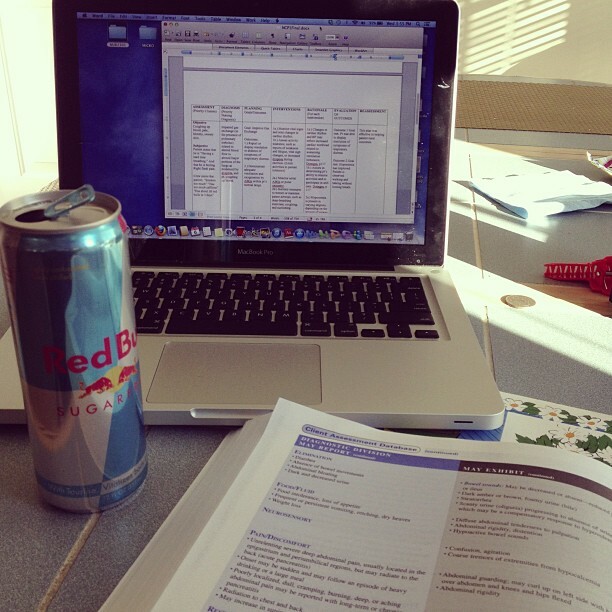 Try as I might every semester is the same – and I cave under the pressure caffeine addiction. Obviously this has GOT TO STOP. It’s just not healthy and the last thing I want is to rely on some performance enhancing substance to be at my best… Has any one gone through caffeine withdrawal? NOT FUN. So stick with me for some ways I’m trying to improve my energy and ability to focus (besides working out)… I already do this every day – so if you don’t, now is the time to start. There is no excuse for not being able to get into the gym for at least 20 minutes a day.